"Melua" redirects here. For the surname, see Melua (surname). Ketevan "Katie" Melua (/ˈmɛluːə/; Georgian: ქეთევან "ქეთი" მელუა, IPA: [kʰɛtʰɛvɑn mɛluɑ]; born 16 September 1984) is a British-Georgian singer and songwriter. She moved to the United Kingdom at the age of eight – first to Belfast and then to London in 1999. Melua is signed to the small Dramatico record label, under the management of composer Mike Batt, and made her musical debut in 2003. In 2006, she was the United Kingdom's best-selling female artist and Europe's highest selling European female artist. In November 2003, at the age of nineteen, Melua released her first album, Call Off the Search, which reached the top of the United Kingdom album charts and sold 1.8 million copies in its first five months of release. Her second album, Piece by Piece, was released in September 2005 and to date[update] has gone platinum (one million units sold) four times. Melua released her third studio album Pictures in October 2007. According to the Sunday Times Rich List 2008, Melua had a fortune of £18 million, making her the seventh richest British musician under thirty. Ketevan Melua, known as Ketino to her family, was born on 16 September 1984 to Amiran and Tamara Melua in Kutaisi, Georgia, which was then part of the Soviet Union. She spent her first years with her grandparents in Tbilisi before moving with her parents and brother to the town of Batumi, Ajaria, where her father worked as a heart specialist. During this time, Melua sometimes had to carry buckets of water up five flights of stairs to her family's flat and according to her, "Now, when I'm staying in luxurious hotels, I think back to those days". In 1993, when Melua was eight, the family moved to Belfast, Northern Ireland, in the aftermath of the Georgian Civil War. Her father, a heart surgeon, took up a position at the Royal Victoria Hospital. The family remained in Belfast, living close to Falls Road, until Melua was twelve. During her time in Northern Ireland, Melua attended St Catherine's Primary School on the Falls Road and later moved to Dominican College, Fortwilliam. The Melua family then moved to Sutton, London, and some time later moved again to Redhill, Surrey. In 2008, Melua moved out of her parents' home in Maida Vale to an apartment in Notting Hill, where she transformed the spare bedroom into a recording studio. Melua is fluent in English and Russian; despite still speaking Georgian fluently she has admitted that she cannot write songs in the language. Melua is also partly of Canadian and Russian ancestry. She is a baptised Georgian Orthodox Christian. When living in Belfast, Melua attended the Roman Catholic schools St Catherine's Primary School and Dominican College, Fortwilliam, while her younger brother attended Protestant schools. After completing her GCSEs at the all-girls' grammar school Nonsuch High School in Cheam, Sutton, Melua attended the BRIT School for the Performing Arts in the London Borough of Croydon, undertaking a BTEC with an A-level in music. On 10 August 2005, just before she turned 21, Melua became a British citizen along with her parents and brother. The citizenship ceremony took place in Weybridge, Surrey. Becoming a British citizen meant that Melua had held three citizenships before she was 21; first, Soviet, then, Georgian and finally, British. After the ceremony, Melua stated her pride at her newest nationality. "As a family, we have been very fortunate to find a happy lifestyle in this country and we feel we belong. We still consider ourselves to be Georgian, because that is where our roots are, and I return to Georgia every year to see my uncles and grandparents, but I am proud to now be a British citizen". In September 2010, Melua was ordered by her doctors to stop working for a few months after suffering a nervous breakdown, resulting in her hospitalisation for six weeks. As a result, all touring and promotional activities were postponed until the following year. In January 2012, Melua confirmed her engagement to World Superbike racer and musician James Toseland. The couple married on 1 September 2012 in the Nash Conservatory at the Royal Botanic Gardens in Kew, southwest London. While performing at BRIT School showcase, Melua caught the eye of songwriter and producer Mike Batt. Batt was originally looking for an acid-rock band, bass player and a singer capable of singing "jazz and blues in an interesting way". [not in citation given] After hearing Melua sing "Faraway Voice" (a song she wrote about the death of her idol Eva Cassidy) Batt signed the 18-year-old Melua to his small Dramatico recording and management company and took her into the studio, producing her first three albums during the ensuing years, plus her fifth and sixth albums. It was initially difficult for Melua and Batt to obtain airplay for the album's lead single, the Mike Batt song "The Closest Thing to Crazy". This changed when BBC Radio 2 producer Paul Walters heard the single and played it on the popular Terry Wogan breakfast show. Wogan played "The Closest Thing to Crazy" frequently in the summer of 2003. Wogan's support raised Melua's profile and when Call Off the Search was released in November 2003 supported by a TV campaign financed by Batt, it entered the top 40 UK albums chart. The single achieved the number 10 spot in the UK chart. After an appearance on the Royal Variety Show the album was further boosted and Batt continued a relentless marketing campaign which saw the album hit the number one spot in January 2004. Call Off the Search reached the top five in Ireland, top twenty in Norway and top thirty in a composite European chart. In the UK the album sold 1.9 million copies, making it six times platinum, and spent six weeks at the top of the UK charts. It sold 3.6 million copies worldwide. Subsequent singles from the album did not repeat the success of the first – the second single and album title track "Call Off the Search" reached number 19, and the third single "Crawling up a Hill" got to number 41. The album achieved 6X platinum status in UK, 3X platinum in Norway, 2X platinum in Germany, Holland, Denmark and Ireland, Platinum in South Africa, Australia and Switzerland and Gold (500,000 units sold) in New Zealand and Hong Kong. Melua's second album, Piece by Piece, was released on 26 September 2005. Its lead single was the Mike Batt song, "Nine Million Bicycles", which was released a week before the album on 19 September and was number 3 in the UK singles chart. The album contains four more songs written by Melua herself, four more by Batt (including "Nine Million Bicycles"), one Batt/Melua collaboration and three more songs described as new versions of "great songs". The band line-up was the same as on the first album. The album debuted at the number one spot on the UK Albums Chart on the week of 3 October 2005. This album broke Melua across Europe where it sold 1 million copies in Germany alone and achieved the number one position in Billboard's "European" albums chart. It was 4X platinum in UK and in Ireland, 3X platinum in Norway, Denmark, Holland and Germany, 2X platinum in Poland and Switzerland and at least platinum or gold in France, Iceland, South Africa, Austria, Belgium, New Zealand and Sweden. Worldwide sales to date are in excess of 3.5 million. Melua released four singles from the album: "If You Were a Sailboat", "Mary Pickford", "If the Lights Go Out", and "Ghost Town". "Mary Pickford", written by Mike Batt, was about the silent film star of the same name and the formation of United Artists along with Charlie Chaplin, D W Griffith and Douglas Fairbanks . "Ghost Town" was Melua's first reggae-sounding song. Melua's fifth studio album, Secret Symphony was released on 5 March 2012 and also debuted high in the UK album chart. The album was produced, arranged and conducted by Mike Batt. Melua said in a statement: "This album was going to be my 'singer's album'. I had always wanted to do this one day; singing other people's songs brings something out of you and your voice that isn't perhaps where you would have gone vocally with your own material." Melua's sixth studio album, Ketevan, was released on 16 September 2013. It was co-produced by Mike Batt and his son, singer-songwriter Luke Batt, both of whom contributed songs, separately and in collaboration with Melua. When Ketevan entered the UK charts at number 6 - Katie joined a very small group of female artists, which includes Madonna and Kate Bush, who have scored 6 consecutive UK top 10 studio albums. Ketevan also entered the top 10 in France, Poland, Denmark, Germany, the Netherlands and Switzerland in its first week of release. Melua's seventh album, In Winter, was released on 14 October 2016. For this record, Melua went back to her native Georgia to record an album with the Gori Women's Choir, a native Georgian all-woman singing troupe. Melua revealed during an interview with The Guardian that her partnership with Mike Batt had come to an end after her last album, as it was a six-album deal with Batt's Dramatico records. "It was a six-album deal," she explains, "so when the sixth one was done, you know – it was finished and it was time for us to part ways.....It was maybe a bit more mutual on one side than the other. Yeah – it wasn’t easy, as you can imagine. And I'm still incredibly proud of the work we did together. But it had to happen and I think it has been mutual ... um, eventually." In 2017, she released a cover version of "Fields of Gold", the official song for Children in Need. Melua has stated that the rock band Queen were a huge influence on her as a child/teenager, with one of her memories of music being her uncle playing records by Queen and Led Zeppelin. She performed with Queen at the 46664 concert in South Africa in March 2005. 2005 Just Like Heaven "Just Like Heaven"
Miss Potter "When You Taught Me How to Dance"
2010 The Tourist "No Fear of Heights"
2011 5 Days of War "No Fear of Heights"
^ Howard Isaac Aronson, Georgian. A Reading Grammar, Columbus 1982, p. 18: "Stress in Georgian is extremely weak and has no effect on vowel quality. The stress is so weak that linguists have not been able to agree on exactly where it falls. In words of four and fewer syllables, the stress falls on either the initial syllable or the antepenultimate syllable (third from the end)." ^ "IFPI confirm Katie Melua as Europe's highest selling European female artist in 2006". Press release. 12 November 2006. Archived from the original on 3 August 2009. Retrieved 10 February 2010. ^ Grimes, Courtney (19 July 2005). "'The Closest Thing to Crazy': An Interview With UK Rocker Katie Melua". Epiphone. Archived from the original on 2 February 2010. Retrieved 10 February 2010. ^ "Melua trivia page". Biography channel. 2005. Archived from the original on 6 June 2009. Retrieved 10 February 2010. ^ Batt, Mike (2003). "Katie Melua". dramatico site. Archived from the original on 13 January 2007. Retrieved 10 February 2010. ^ "Melua Profile". purevolume. Archived from the original on 1 May 2018. Retrieved 10 February 2010. ^ Murray, Rebecca (22 August 2005). ""Just Like Heaven" Movie Soundtrack News". About Movies. Archived from the original on 6 March 2009. Retrieved 10 February 2010. ^ "Q&A Interview with Andrea McEwan". alt sounds. 1 December 2008. Archived from the original on 31 January 2010. Retrieved 10 February 2010. ^ Barnett, Lauren (9 September 2016). "New album IN WINTER from Katie Melua featuring the Gori Women's Choir to be released October 14". Maverick. Retrieved 14 September 2016. ^ "Katie Melua announces new album 'In Winter'!". Front View Magazine. 28 August 2016. Retrieved 14 September 2016. ^ Hickling, Alfred (17 August 2016). "'Stalin sent granddad to Siberia': Katie Melua Goes Home to Georgia". The Guardian. Retrieved 21 August 2016. ^ Melua, Katie (15 June 2005). "Katie Melua in Sri Lanka". Save the Children. Archived from the original on 9 October 2007. Retrieved 10 February 2010. ^ "Company announces its charity of the year - Isle of Man Today". Iomtoday.co.im. 30 January 2014. Archived from the original on 26 April 2014. Retrieved 27 June 2014. 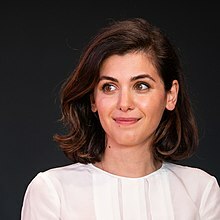 Wikimedia Commons has media related to Katie Melua.